That's Aerin Lauder, talking about the inspiration for Tangier Vanille, which she released under her casual-luxe Aerin lifestyle brand last year. Of the fragrance itself, Lauder promises that it "opens a secret door that leads you into the mystery and splendor of Morocco". Tangier Vanille opens with bright citrus and fruity jam, plus a few vague flower petals which may or may not be the "rich Bulgarian rose" promised in the fragrance notes. It softens quickly into a middle-weight woody amber musk. There is vanilla, but it's lighter than I would have expected. It's not foody at all, and it is no more than mildly spicy. The base is creamy, with just a smidgen of powder, and there is a definite, but not overwhelming, undertone of PlayDoh, which you will either like or you won't. It's rather quiet (and mostly linear) after the first 20 minutes, although the PlayDoh does fade to a more basic dry woody musk after a couple hours. The lasting power is ok but not stellar. Tangier Vanille is being marketed to women but I would call it a unisex. Verdict: If I was smelling Tangier Vanille blind, I would not have guessed that it was meant to be a vanilla fragrance, much less that it costs what it does. Tangier Vanille did not call up the mystery or splendor of Morocco, and I did not think it was particularly elegant or sophisticated. All of that aside, I found it reasonably attractive and wearable. My favorite of the line so far is still Evening Rose, but Tangier Vanille is now in second place. That's not necessarily saying a whole lot, given that neither of them came even close to making my buy list, but still. Tangier Vanille would make a decent sort of no-brainer comfort scent for cool weather, and I'm sure it will find fans (or, I should say, has found fans — I'm awfully behind). Other than the PlayDoh, Tangier Vanille is fairly similar to Aerin Amber Musk, so you might want to smell both before you buy. If you're mostly after the PlayDoh, you might want to try my personal favorite in that category, The People of the Labyrinths Luctor et Emergo. If you were after a casual light vanilla, you might consider Diptyque Eau Duelle. 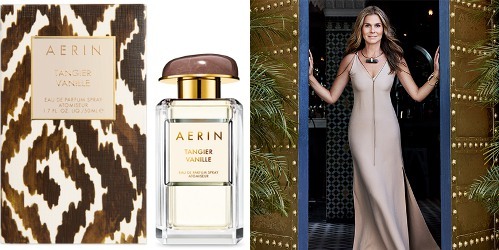 Aerin Tangier Vanille is available in 50 ($115) or 100 ($160) ml Eau de Parfum. There is also an 8 ml rollerball ($28), plus scented body products. 1. Via the Estee Lauder website. Thanks for this review Robin. I have been interested in this for awhile, although I have never tried anything from this line. Now I know I don’t need to really seek it out, since I was looking for something with more spice. Give it a shot — you never know, maybe the line will suit you more than me! But do doubt this will fill anyone’s spice needs. For that dress and shoot, why go outside Maison Rochas and wear either vintage Byzance or Tocade? If the Guerlain Les Deserts d’Orient were still manufactured, I would suggest one of those. If none of those sut, what about Byredo Bal d”Afrique ? Yes — to me these smell like they cost a little more than Pacifica but WAY less than they do. Thank you for this straight-up review and especially for the cover challenge! Hm. Wearing brown and no discernible make-up or hair styling. But very obviously very fit, revealing fully naked arms as women in the best circles are required to do, and thrusting hips forward. A certain kind of olde-worlde gentleman not yet entirely extinct would say “a fine filly”… I’m going with Galop d’Hermes. ha, following your line of thought, recommending Caleche or RL Safari. When I think of Moroccan smells, I remember when I was there in the ’70s. I think of the vast Medina in Fez, where one time I walked by the almond sellers – there were dozens of stalls of almonds, all sizes from your little fingernail, up to the size of your entire thumb. And the odor was intoxicating, as they say. And I remember the smells of the camel market in Ourzazat. And the heat and moisture of the old hamam in Erfoud where we were stuck for a week when our vehicle broke down. This was before tourism hit the big time. We found no one there who spoke English the entire time….Clearly none of this has anything to do with Aerin’s experiences….LOL. You will see the accessories she recommends for the Tangier experience, including a $40 gold toned hair comb and leopard print ballet flats, marked down from $550 to $269. $269 ballet flats! That also has nothing to do with my life. LOL. C’mon. You need shoes when your car breaks down in Erfoud! Goodness, I do need to get out! I haven’t had a chance to get to NM or anywhere to sniff any of the fragrances that have come out. My favorite from the Lauder line is Ikat Jasmine and Evening Rose is right behind that. I am a fan of Aerin Lauder fragrances, but I do agree that they are quite pricey. I do want to try Tangier Vanille even though there isn’t a lot of vanilla. I am a bit turned off about the play-doh note, but maybe I can get past that. We shall see. We are opposites — without the Playdoh, this would have just been a bland woody amber to me! Damning it with faint praise! A really fun kind of review. I *think* the Play Doh note may be some sort of tonka bean chemical – at least that’s what I’ve figured out over the years of finding that note and then trying to figure out what causes it. Your reference to Luctor et Emergo really takes me back – there was a lot of buzz on here about that one when I first started reading NST. Well interesting. It is rare, the PlayDoh, so it would seem odd if it was from ubiquitous tonka bean, but you know I’d be the last to know! I forget to wear POTL, which is too bad — it is still one of my favorite comfort scents. I don’t always get it when tonka is listed as a note, only sometimes, so it may very well be something else. I get it from some of the newer versions of Shalimar. I’ve yet to find an Aerin that I really like let alone one that I would be willing to pay for. The ad seals it. Can anyone think of a fragrance that is perfect for expressing annoyance? 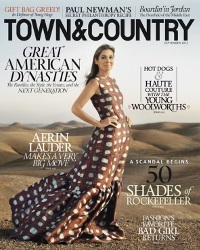 She really sets my teeth on edge, Aerin Lauder, which seems silly, but she does. The videos they’ve done for these fragrances literally make my skin itchy. Whatever the fragrance is for that kind of visceral distaste couldn’t be pleasant! She has the exact same effect on me, and I haven’t even watched the videos. For a time, back in the 90s, I worked for one of the Lauder brands in NYC and had the chance to meet Aerin a few times. You are not alone. There’s something unnerving about her. I put her in the same category as Gwyneth: No. Just no. I’ve only tested it once so far, but I think I agree with Angela on Tauer’s Au Coeur du Désert Extrait. I loved the original L’ADDM when I got it, but the patchouli is beginning to wear on me. I don’t know if it could have gotten stronger with the years, or maybe other notes have faded, changing the balance; or have my tastes change? ACD seems drier and more subtle. This would be my choice for the photo. BTW, the shape of caps on those bottles really bothers me. It looks like they were inspired by the Aramani Prive caps, which I like, but not this adaptation. They absolutely look like they were inspired by the Prive caps, agree. I admit I was never a fan of LADDM, and I do like the AC version much better…but even that one, I do not love. Agree it is a good fit with the photo, though! I wanted it to be Tangerine Vanilla. I would buy Tangiest Vanille, probably. But I don’t love the cover at all, so very brown! I’ve spent a very short time in Morocco as a teenager, we were on vacation in Spain and took a boat trip there. I remember it as quite colorful and opulent, the very fragrant markets, sweet mint tea and a lot of people everywhere. My scent pick for the very brown cover is… RL Safari if I’m being kind. For Morocco itself CdG Nomad tea or L’Occitane Tea verte eau menthe. Well, to be clear, I think the cover is ridiculous. Safari is actually a perfect fit. Hiking the Atlas Mountains is one of my old dreams. Being in a photo shoot, on the other hand, sounds dreadful. But ok, let’s play. I’d be wearing either Rochas Femme or SL Arabie, because they both have this golden sand under the sunset vibe. I spent a month in Morocco two years ago staying with friends who live there. Aerin Lauder’s cluelessness is beyond irritating to me. What does vanilla, the product of a climbing orchid that grows in humid subequatorial forests, have to do with arid and mostly treeless Morocco at all? It certainly isn’t characteristic of the atmospheric smells or cuisine there. In any case, light scents of any kind are pretty much pointless in Morocco since they completely disappear in the dry air. They would be evident only if you stayed inside in air conditioned spaces which would mean you wouldn’t see most of the country. Then there are her photographs which I don’t much want to scent since her completely bare arms in both pictures and her bare shoulders and cleavage in one would be considered disrespectful by many Moroccans. But clearly the people who actually live there aren’t her intended audience. The perfumes that capture what I experienced in Morocco would include just about any SL, PG Harmatan Noir, DSH Majoun, CDG Blue Cedrat. If I could find a scent that captured the intoxicating lavender and carob honeys I smelled in the souk in Fez I’d buy it in a heartbeat. Majoun — I almost forgot that one! I can’t argue with anything you said, but I do think the cultural appropriation here is no better and no worse than most mainstream brands. I’m not sure why I find her marketing approach in particular so irritating, but I sure do. Sorry for the rant. It’s been a hard couple of days. I don’t think of this one as cultural appropriation since I don’t see any element of actual Moroccan culture in it. I’d put it in some category of marketing instead. Cynical or just dumb, I’m not sure. As a projection of fantasies on other cultures, I agree this is relatively benign. The list of perfumes that you and commenters here have come up with is all ways so much better! Adding Azemour as a heartfelt, beautifully made perfume that actually smells like an orange grove in Morocco and which does not cost the world. No need to apologize, I was ranting too! Azemour is perfect, and one of my favorites so it’s crazy I did not even think of it. If I am going full on rich spices and exotic – it’s going to be Tauer’s Maroc pour Elle. Perhaps my fav ever of his and that type of elegant patchouli fragrance. I used to work in a department store for a niche perfume company and we would always get a lot of perfumes for free. That’s how I got to add to my collection the discontinued Private Collection Amber Ylang Ylang. The kind of fragrances I would call cuddle me fragrance. When I first smelled and tried Tangier Vanille, I first thought of a retake/rehash of PCAYY. I didn’t feel the need to buy it but I liked it a lot. Yet I recently ordered the body cream and I love it. It’s a rather safe/easy Oriental fragrance, that doesn’t evoke Morocco for sure and it was interesting to read the previous comments about this kind of nonsense. I don’t know if it will stay on the market for a long time but I have to say I like it, I like the name and the packaging. I recently purchased Aerin’s “Garden Rose” from Nordstrom and will be returning it. As with the other Aerin fragrances – smells terrific but NO LASTING POWER (at least on me). Going back to my favorite and yes, it’s been d/c’d but I ordered it via Nordstrom that had 2 left…Estee Lauder’s “Aliage” – a scent that’s super summer, GREEN and up-for-spontaneous FUN! I also wear Estee Lauder’s “Private Collection” for evening wear and special occasions.